Nature Forever Society is an organization committed towards protecting nature, promoting research, education and advocacy. It has been working for the conservation of House Sparrow and other common flora & fauna since 2006. The mission of Nature Forever Society is to involve citizens into conservation movement in India and keeping this in mind it has spearheaded various programs and projects that are making a difference. 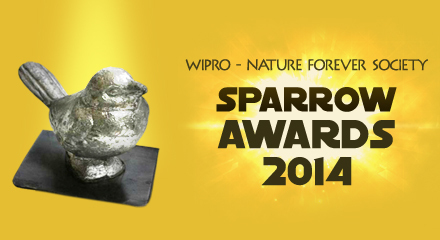 Wipro- Nature Forever Society Sparrow Award is a award that recognizes inspirational work carried out by individuals towards nature conservation. The first Sparrow Awards were instituted in 2011 by Nature Forever Society with an aim to identify people making vital contribution in a selfless way to save the environment. The award intends to honor unsung environmental heroes who have been silently making a difference to the environment over the years. These individuals are not professional conservationists, ecologist, researchers or environmentalists but are citizens who take out time and work with their own resources for conservation. It is important that such heroes be identified and honored for the work undertaken by them and for being the inspiration for other citizens to get involved into conservation. • To involve citizens from diverse sections of the society in the conservation movement. • To honor the work of individuals and organizations at the grassroots level for strengthening the conservation movement for better protection of the environment and biodiversity.